Veterans’ Day. With a Side of Glitter. Our neighbors, Gerry and Sue, have been adopted by my sons as our local grandparents. Gerry and Sue really had no choice in this matter; they were stuck living next door to us, and so far have seemed up to the job. Sue brings by cupcakes for no reason. Just random, fly by cupcakes, all willy nilly, at our door. It’s awesome. Gerry loaned us a bike for Blonde that has been so well used it is falling apart. Blonde has named it “Rocket” and it will be passed down to Red as soon as he can ride it without training wheels. This might be a while, as when Red does attempt it, the descriptor “careening wildly about all hell-bent for destruction” comes to mind. He is safe on his Diego bike training wheels for now, but Rocket waits patiently. Gerry is a veteran. This is something I remember about once a year on Veterans’ Day. This seems wrong – it shouldn’t be like that. A soldier’s responsibility to our country is so huge and selfless, it kinda feels like I should be loading Gerry up with ‘thank yous’ all the time. But perhaps that would get a bit weird. Like so many things in my life, fraught with good intentions, but yep, still very weird. Anyhow. 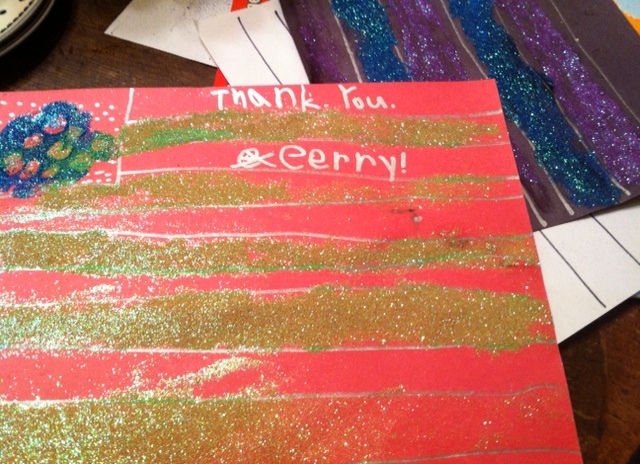 On Veterans’ Day this year my sons and I wanted to thank Gerry. And, as my wee ones always tend to ask when a ‘thank you’ is in order – “Canna we do da glitter?” Red had a longing glint in his eye; it had been over three long weeks since his last hit of glitter. Blonde, even longer. He looked wan and disheveled. Glitter is hard to quit. I took pity on them and said a prayer. 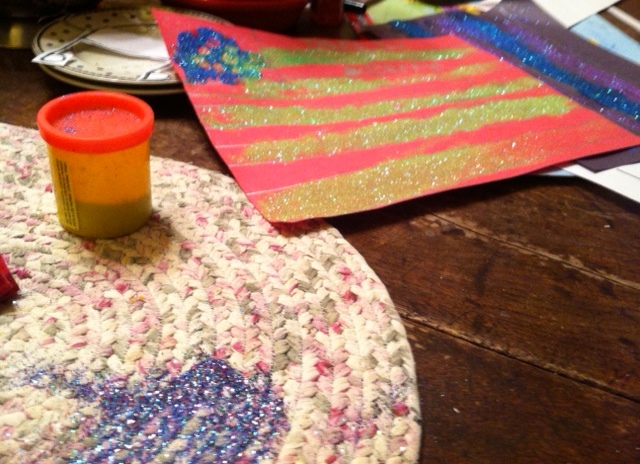 Because nothing says “Thank you for your service to our country” like der sparkles, ya’ll. At least that’s the way it is in our family. By the end of this craft both of my boys were so shellacked in glitter that I had to take off their shirts and shake them out in the back yard (the shirts, not the boys). Glitter stuck to Blonde and Red’s eyelashes and to their hair. They streaked glitter across their little white chests and it looked like they were going out to a rave later. All they needed was some glow sticks and some techno beat music, and they’d fit right in. And don’t get me started on the cat. We made pretty glittery flags that were nowhere near to actual red, white, and blue colors, so something in me kinda worried that this was breaking some sort of flag rule. I chalked it up to “creative expression” which, heck, we can thank Gerry for. And as we ate dinner, and the hubs asked, “What’s with the sparkly stuff?” we explained we were thanking our veterans with it. As I picked glitter out of my mashed potatoes I did the same. And this morning, as I found glitter in my toothbrush, I remembered to thank Gerry. I have a feeling I will be thanking Gerry all day long. Thank you to all the veterans. 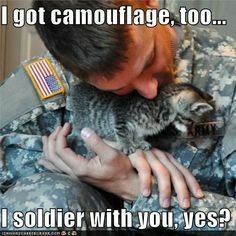 You protect us; you sacrifice for us. My twinkling babies and I thank you so very much.